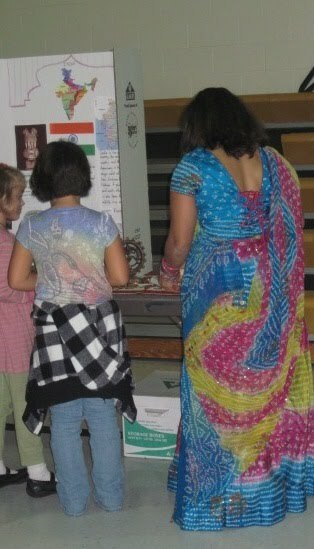 My daughter's school has an "International Night" event each year. This is the first year we've gone. The goal, of course, is to find a fun way to orient the children to our global community as well as to celebrate the diverse heritage of children and families within the school and our local community. The evening started with a Parade of Flags. Sixty countries were represented. 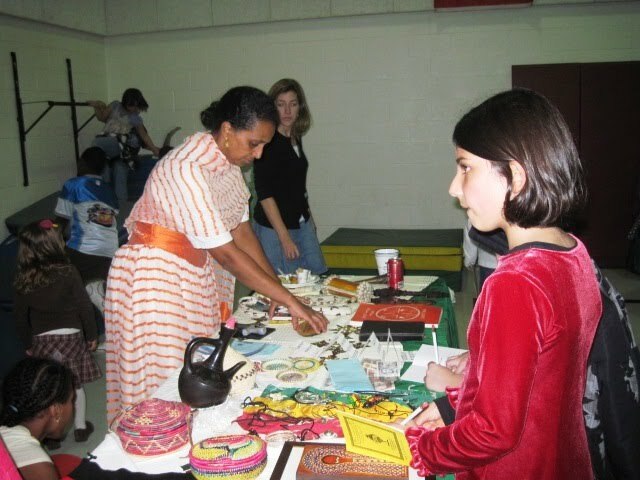 Then there are performances, which included Irish clog dancing and a martial arts demonstration by local groups. 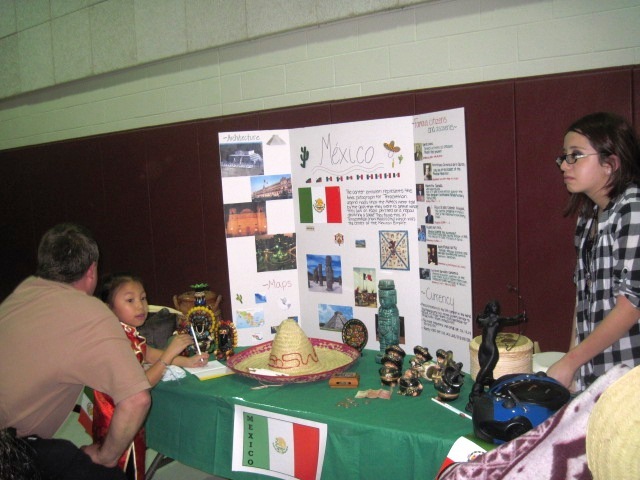 And, "trade show" style displays with artifacts and information from various countries. 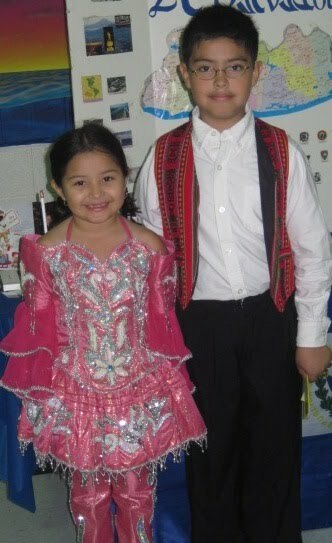 Many people were dressed in traditional dress from their country of origin. It was really very nice. A big part of the experience is the food sampling (which is free). There was food from ALL over the world there. Ironically, my children and I chose Pierogies (Polish), Potatoe Salad (German), Egg Rolls (Chinese), Scones (English) and Pasta Salad (from Mexico?? that's what they said). The ironic part is that we eat these at our house all the time. When I commented to that affect on Facebook, my friend responded that every day is International Day in the US. And, especially when it comes to food, and especially in my house, that is true. But, it was not always that way. Traditional regional cuisine here is meat and potatoes, and in season (and if you had the money) blue crab. As a kid, pizza or speghetti was considered international food! When I first had fetticini alfredo I was an adult. I didn't eat a taco until after I was married! I had Vietnamese food for the first time when I was about 27; and it wasn't that long ago that I tried Thai food or Mongolian food for the first time. But, the best is this: I didn't have Chinese food until I was 21...And, I was on a date. Imagine how embarrassed I was that I didn't know what to do when they brought me 2 plates! Here I was, not understanding why I was supposed to keep my rice on another plate, and my date was eating with chopsticks (something I still can not do). I am blushing just remembering how stupid I felt! My husband also grew up locally, but his dad was from Pennsylvania and his family's diet was influenced by the German heritage. When he was single (and younger), my husband used to eat a lot of German and Polish sausages, Sauerkraut, Pierogies and that kind of thing. Now, at our home, we eat meat and potatoes; but THAT'S a rarity. We eat tacos, fajitas, fancy nachos or something Mexican usually once a week. We alternate Chinese or Pizza delivery on Friday nights. Speghetti, fetticini, Chicken Carbonara or Parmesan are a norm. .... And we don't consider any of this "foreign" food, after all, we eat it in our own home. The world has changed a lot. My community is much more diverse. And, so, "...as the world turns..." this diversity is now reflected in our restaurants, and even in the foods we eat at home. As we're introduced to new cultures, tastes and traditions, it is interesting to watch how it so quickly gets integrated into our own, very "American" experience.